The name of the “Old Hoss” was most likely derived from a popular song of the time entitled “Off to Brighton”, by Charles Blamphin about a ride in a horse-waggon. The song contains the lines, “Oh my, you ought to see us going, 2:40 in the dust, the Old Hoss a-blowing”. The building was erected around 1855-6 and first used as the premises of Daniel White, a Baker and Fruit-seller. 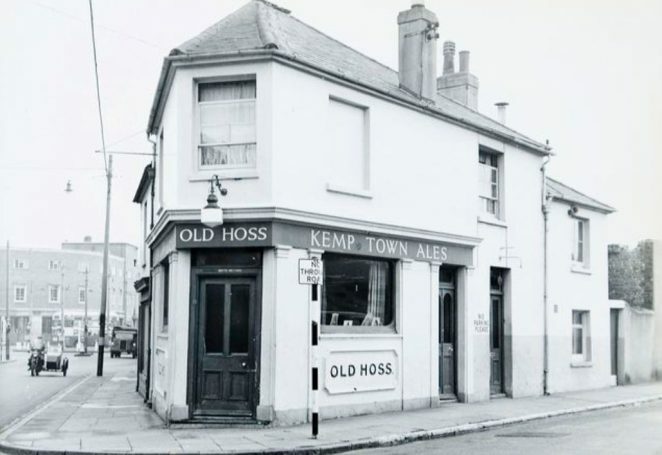 By around 1865 it had become a grocer’s and within another couple of years had been converted into a beer-house by Charles Marshall, who probably gave it the name. Originally the address of the building was 4, Montpelier Road North, but the road was renamed to New England Road around 1871. The building was altered in 1928 and the final “last orders” were called in 1960, after which the pub was demolished. Isn’t that the Fire Station in the fore ground? I have been looking for this pub. In the end good old Google found it. My grandmother ran The Old Hoss with her second husband, Bob Pomfrey. I will have to find out when she left. I still remember the smell. I remember the landlady of the Old Hoss in the late 50s: her name was Primrose.